I was born September 16th, 1983, at 12:44am. My mom had a smooth pregnancy, no complications. There was no indication that I was a dwarf prior to my birth, (I was my parents first child). From what my parents were told, I was to be a healthy 6 lb baby. After I was born, they noticed something was not "right". Therefore, I was rushed away. My parents were then told, that I would not live another hour (I'd LOVE to meet the morons who told them that!). They later got a diagnosis, that I was a dwarf and had the form called "Diastrophic Dysplasia" and I was put in the NICU (Neo-Natal Intensive Care Unit) for around 27 days until my parents were allowed to take me home. My parents were put back, as in; they did not have a clue to what was going on. They were then sent to genetic counselors. NEVERTHELESS, they handled everything VERY well! And I have a lot of respect for them! They did not give up when they were told they should have. They went on to have my average height sister and then my diastrophic sister Kathleen. "Diastrophic dysplasia was first characterized by Maroteaux and Lamy in 1960. Prior to this, patients with diastrophic dysplasia were described as having achondroplasia with clubfoot or arthrogryposis multiplex congenita (a condition where a person has multiple joint contractures). 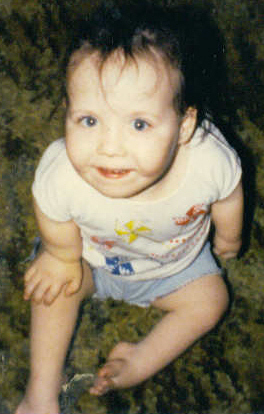 Physical features present at birth include short-limbed dwarfism, hitchhiker thumb, and clubfeet. Abnormalities of the palate such as cleft palate or submucous cleft occur in 50% of patients. The ears swell in the first days to weeks of life in 80% of individuals which then subsides spontaneously. Later, the ears have a cauliflower appearance. Fingers are short and broad with ulnar deviation. The thumb has a hitch-hiker type appearance. There is increased mortality in infancy due to respiratory complications but thereafter, people with diastrophic dysplasia have a normal life span. Orthopedic problems are common. The joints can be dislocated, especially the shoulder, elbows, hips, and patellae (knee caps). Flexion contractures of knees and shoulders are common. Scoliosis is not present at birth but often is progressive, especially in the early teens. Treatment of the scoliosis includes bracing and occasionally, spinal fusion. Progressive cervical kyphosis can also occur with subluxation of the cervical spine which can result in spinal cord compression. The average length at birth is 42cms. Horton et. al. in 1982 published a growth curve of individuals with diastrophic dysplasia. The average adult height is 118cms with males ranging from 86-127cms and females ranging from 104-122cms. Final height is influenced by the presence of scoliosis, hip and knee contractures, and foot deformities. Diastrophic dysplasia is inherited as an autosomal recessive condition. This means that average-sized parents have a one in four (or 25%) chance of having additional children with diastrophic dysplasia. Diastrophic dysplasia occurs at very low frequency in most populations but is seen frequently in Finland. The gene for diastrophic dysplasia has been found and is called diastrophic dysplasia sulfate transporter (DTDST). Prenatal diagnosis has been performed using ultrasound and by molecular DNA diagnosis." OK, and the list goes............... sub-bloxed(sp) knees (the kneecaps were turned outwards), cauliflower ears, finger-joint fusion (the middle finger and ring finger on each hand, the middle joint is fused), cleft pallet, and clubfoot. Those were visible at birth. At the age of 9 or so, I developed scoliosis. And at age 11, I had a Spinal Fusion (which has held up since!). I had surgeries to re-pair my knees, clubfeet (heel-cord lengthening, and cleft pallet. I am also starting to experience arthritis in my knees, which from what I read, happens in 100% of cases. Diastrophic dwarfism is a rare skeletal dysplasia first defined by Maroteaux and Lamy in 1960. More than 200 cases have been described in literature (most from the U.S. and Finland). Autosomic recessive transmission. ( D.T.D. and the McKusick type metaphyseal chondrodysplasia are the only bone dysplasias with AR transmission). 5-6% of cases due to new mutations. Diagnosis at birth can be suspected because of the typical features. Most patients have a normal life-span expectancy. Average adult height: 112 cm for both sexes (range 87 - 127 cm). Short-limb dwarfism, usually rizomelic (40%) or mesomelic (29%) . Puberal growth spur does not occur in these patients. Spinal deformities and hip and knee contractures accentuate the apparent dwarfism. Nomocephalic head but typical facial appearance because of the squared jaw, the narrow nasal bridge and the fullness of the circumoral area. These children are been called "cherub dwarfs". Cleft palate in 27 to 59% of cases (lower frequency in diastrophic variants and higher in lethal variants). Cauliflower ear deformity in 85% of typical DTDs and in 25% of diastrophic variants. It occurs during the first 6 weeks of life after an acute inflammatory process. Hearing impairment not usual (it is related to fusion of ossicles). Some patients present deformities of larynx and upper airways (laryngo and tracheomalacia). They can develop severe respiratory insufficiency. The combination of marked limitation of motion of all major joints together with a tendency to dislocation and subluxation characterize this disease. Some authors believe there are 2 forms of DTD: the lax and the stiff type. Virtually every joint is likely to develop stiffness. This is due to the severe deformities of bones (epiphyseal and metaphyseal) as well as soft tissue contractures. Progressive dislocation of the hip, patella, radial head are often observed. Hip dislocation and hip dysplasia have been reported, respectively in 22% and 70% of patients. Delayed femoral head appearing, coxa valga or, on the contrary, coxa vara are common findings. Valgus deformity of the knees, associated to flexion contracture, is another common finding. Clubfeet are another diagnostic feature occurring in almost every patient. Clubfeet are usually very stiff and require surgical correction. 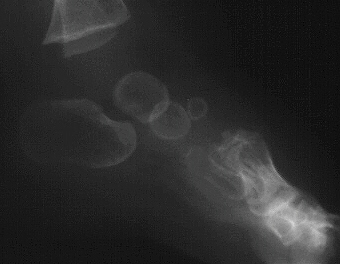 Particular findings are the adducted forefoot with a severe inward curvature of the metatarsals . Hand deformities are essential for diagnosis and they are present in almost 100% of cases. Hands are short and broad and deviated because of the ulnar shortness. PIP joint stiffness is in contrasts with the hypermobility of the thumb that is abducted over a short first metacarpal ("hitch-hiker" deformity). Non-progressive lumbar lordosis is present in all patients and it is probably related to flexion contractures of the hips. Cleft vertebral laminae are common in both cervical and lumbar spine. Interpediculate narrowing occurs in 75% of patients but spinal stenosis is unusual because pedicles are not short, the posterior arch is relatively normal. Scoliosis or kyphoscoliosis occur in 80% of patients. These curves usually onset during the first 2 years of life and they are not due to primary vertebral deformities. They must be carefully monitored because of the potential progression (usually during adolescence). Most authors suggest an aggressive orthotic treatment and early spine fusion. Diastrophic dwarfs do not present atlo-axial instability or foramen magnum stenosis. In some cases their C-spine develops progressive kyphosis secondary to wedging of the lower cervical vertebrae. Progression of this deformity can lead to neurologic deficits and death unless the patient undergoes posterior or anterior and posterior spinal fusion. The whole spine should be carefully monitored since the first year of life. Spine: generally the vertebral bodies are normal before the development of spinal deformities. As previously mentioned, cleft laminae are common. Deformities in C-spine vertebrae. Long bones: they are broad and short. Metaphyses are flared and expanded. 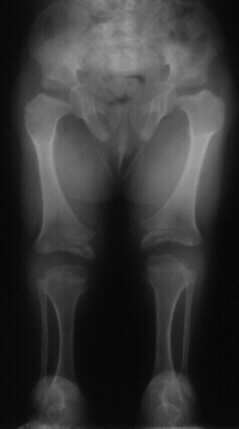 A chevron-like shape is often present in femoral and tibial metaphyses. Epiphyseal centers appear late and are severely irregular and flat. Ulna and fibula are usually short. Tubular bones in hands and feet are short and broad with typical deformities in first metacarpal and in metatarsals . Achondroplasia: no joint contractures (except elbows), no clubfeet, hitchhiker thumb and ear deformities. Metaphyseal involvement (flared) but epiphyses are normal. Skull involvement. Typical vertebral body deformities. SED: short-trunk dwarfism with stiff hips and often cleft palate and clubfoot, but no thumb and ear involvement. Severe deformity of vertebral bodies and epi-metaphyseal involvement of the proximal femur. Larsen syndrome: typical flat face, multiple joint dislocations present at birth. Sometimes cleft palate, clubfeet and progressive cervical spine kyphosis. No real dwarfism. No epi-metaphyseal abnormalities and absence of the ear and thumb deformities. Literature data are not enough to evaluate the orthopaedic treatment of this disease. Prevention and treatment of contractures, dislocations as well as spinal and foot deformities should be the goal of the orthopedist. During normal development before birth (embryonic and fetal development) as well as development during early childhood, cartilage in many areas of the body is gradually replaced by bone (ossification). In addition, a layer of cartilage (epiphyseal cartilage [growth plate]) separates the shafts (diaphyses) of long bones (e.g., bones of the arms and legs) from their ends (epiphyses), allowing long bones to grow until the cartilage is no longer present. In those affected by diastrophic dysplasia, however, there is delayed growth before and after birth (prenatal and postnatal growth retardation), the development of the ends of the long bones (epiphyses) is irregular, and the ossification of the epiphyses is delayed. Thus, affected newborns and children typically have markedly short, bowed arms and legs and short stature (short-limbed dwarfism). In addition, in such cases, growth failure is typically progressive, in part due to absence of the "growth spurt" that usually occurs during puberty. The severity of such growth failure may vary greatly from case to case, including among affected siblings. Due to abnormalities of skeletal development, infants and children with diastrophic dysplasia also have additional distinctive malformations of bones of the hands, feet, and other areas of the body. For example, the first bone within the body of each hand (first metacarpals) may be unusually small, short, and "oval shaped." As a result, the thumbs deviate away (abduction) from the body ("hitchhiker thumbs"). In addition, other fingers may be abnormally short (brachydactyly) and joints between particular bones of the fingers (proximal interphalangeal joints) may become fused (symphalangism), causing limited flexion and restricted movement (reduced mobility) of the finger joints. In some cases, bones of the wrists may also be malformed due to premature ossification. Infants with the disorder also typically have severe foot deformities (talipes or "clubfeet") due to abnormal fusion and deviation of bones within the body of each foot (metatarsals). In most cases, the heels turn outward (talipes valgus) while the fore part of each foot deviates inward (metatarsus adductus). 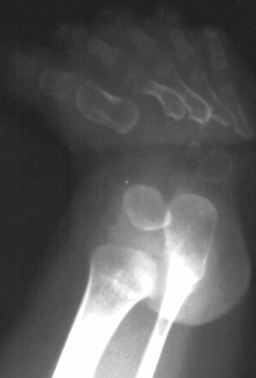 In other infants, the soles of the feet may be flexed (talipes equinus) and, in some cases, the heels may also turn inward (talipes equinovarus). The great toes, like the thumbs, may also deviate away (abduction) from the body. A gene responsible for diastrophic dysplasia, known as DTDST (for "diastrophic dysplasia sulfate transporter" gene), has been located on the long arm (q) of chromosome 5 (5q32-q33.1). Chromosomes are found in the nucleus of all body cells. They carry the genetic characteristics of each individual. Pairs of human chromosomes are numbered from 1 through 22, with an unequal 23rd pair of X and Y chromosomes for males and two X chromosomes for females. Each chromosome has a short arm designated as "p" and a long arm identified by the letter "q." Chromosomes are further subdivided into bands that are numbered. For example, 5q32 refers to band 32 on the long arm of chromosome 5. As discussed below (see "Affected Population"), diastrophic dysplasia is particularly frequent in Finland. Genetic analysis has revealed that a specific mutation, designated as "DTDST(Fin)," is present in affected members of many Finnish families (kindreds) and suggests that a single mutation event may have occurred in a common ancestor (i.e., founder mutation) in the past. However, in some Finnish kindreds, the disorder has been shown to result from different DTDST gene mutations (DTD-causing alleles) that do not descend from the common ancestral (founder) mutation. In addition, different mutations of the DTDST gene have been identified in some non-Finnish individuals with the disorder. Diastrophic dysplasia affects males and females in equal numbers. The disorder was originally recognized as a distinct disease entity based upon a 1960 report by investigators (Lamy M, Maroteaux P) who discussed three observed cases as well as 11 similar cases previously recorded in the medical literature. Since then, researchers have indicated that diastrophic dysplasia may be one of the most common forms of skeletal dysplasia. Although the disorder appears to occur in most populations, it is thought to be particularly frequent in Finland, where reported cases have included affected members in over 80 families (kindreds). Associated symptoms and physical findings may be extremely variable from case to case, including among affected members of the same family. Atelosteogenesis type II, also known as neonatal osseous dysplasia I, is a rare genetic disorder caused by abnormal changes (mutations) of the disease gene (DTDST) that is also responsible for diastrophic dysplasia (allelic disorder). Although the disorder has many symptoms and findings similar to those associated with diastrophic dysplasia, it is typically more severe. Atelosteogenesis type II is characterized by marked shortness of the arms and legs (micromelia), outward deviation (abduction) of the thumbs and great toes, and severe deformity of the feet (talipes or "clubfeet") in which the soles are flexed and the heels are turned inward (talipes equinovarus). Additional characteristic features include an unusually small chest (thorax), abnormal flatness of certain bones in the spinal column (vertebrae), abnormal sideways curvature of the spine (scoliosis), front-to-back curvature of vertebrae within the neck area of the spine (cervical kyphosis), and/or incomplete closure of the roof of the mouth (cleft palate). Due to abnormalities of cartilage within the voice box (larynx), windpipe (trachea), and air passages in the lungs (bronchi), affected infants may experience narrowing of the larynx (laryngeal stenosis), abnormal softness of cartilage in the trachea and bronchi (tracheobronchomalacia), and underdevelopment of the lungs (pulmonary hypoplasia). Such abnormalities may result in collapse of such airways, causing life-threatening complications shortly after birth, such as respiratory obstruction and difficulties breathing (respiratory distress). Atelosteogenesis type II is inherited as an autosomal recessive trait. Pseudodiastrophic dysplasia is a rare genetic disorder characterized by abnormally short arms and legs and short stature (short-limbed dwarfism) and severe deformities of the feet (talipes or "clubfeet") that tend to respond well to surgical treatment and physical therapy. Additional features may include dislocations of certain joints in the fingers (proximal interphalangeal joints), dislocations of the elbows, flattening of the central regions of bones in the spinal column (platyspondyly), abnormal sideways curvature of the spine (scoliosis), and/or other abnormalities. 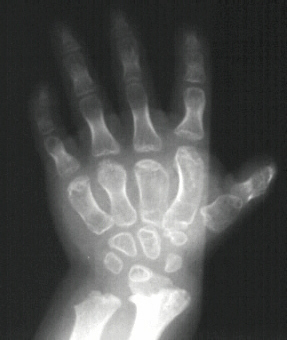 In contrast to individuals with diastrophic dysplasia, the first bones within the body of each hand (first metacarpals) have a normal appearance and the outer, visible portions of the ears (pinnae) do not experience the inflammation and cystic enlargement often seen in those with diastrophic dysplasia in the first weeks of life. Pseudodiastrophic dysplasia is inherited as an autosomal recessive trait. The treatment of diastrophic dysplasia is directed toward the specific symptoms that are apparent in each individual. Treatment may require the coordinated efforts of a team of specialists who may need to work together to systematically and comprehensively plan an affected child's treatment. Such specialists may include pediatricians; physicians who diagnose and treat abnormalities of the skeleton, joints, muscles, and related tissues (orthopedists); surgeons; physical therapists; dental specialists (orthodontists); specialists who assess and treat hearing problems (audiologists); and/or other health care professionals. 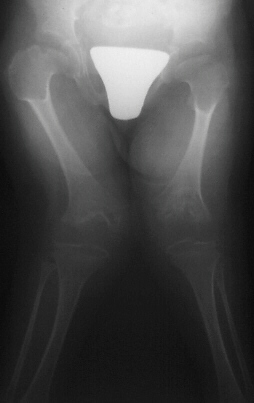 In addition, various orthopedic techniques, including surgery, may also be used to help prevent, treat, and/or correct certain skeletal deformities associated with diastrophic dysplasia. In some cases, physical therapy in combination with surgical and supportive measures may be helpful in improving an affected individual's ability to walk and perform other movements (mobility). According to the medical literature, although the foot deformities (i.e., talipes or clubfeet) associated with the disorder may be resistant to treatment, early, persistent therapy may be helpful in achieving beneficial results. 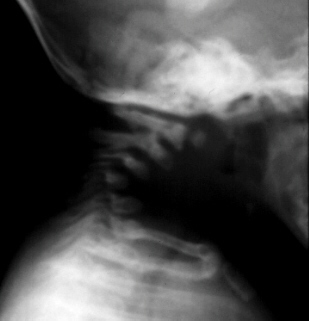 In addition, because particular skeletal changes associated with diastrophic dysplasia are progressive (e.g., kyphosis) and, in some cases, may lead to severe complications (e.g., respiratory distress, compression of the spine, potential paresis or paralysis), physicians may perform ongoing monitoring to ensure prompt detection of and appropriate preventive and/or corrective measures for such abnormalities.